Surely there is nothing more frightening in this world than the words, ‘starring David Bowie’. Well actually, yes, there probably is: but in the world of cinema few things come closer. Admittedly the Thin White Duke has had his thespian moments, notably as the assassin Colin Morris in 1985’s darkly neurotic, spot-the-director movie ‘Into the Night’. But beyond that his film successes have been few and far between. Yet even Sir Wooden couldn’t detract from the glorious, indulgent, wish-fulfilment Fantasy that is Jim Henson’s ‘Labyrinth’. And if the movie looks at times like ‘Monty Python meets the Muppets’ that’s because it more or less is: the script comes in part from Python regular Terry Jones and Muppet-master Henson (who also directed), with contributions from children’s author Dennis Lee and legendary Hollywood movie maker Elaine May, as well as George Lucas serving as the executive producer. The story itself centres on Sarah (played by a young Jennifer Connelly before her ‘Rocketeer’ babe status of the early 1990s) whose imagination is filled with Fairytale romances of princes and princesses but whose daily life is filled with the mundane chore of babysitting her baby brother, Toby, for her parents. In frustration she pleads with the Goblins to come and take Toby away to their magical realm little realising that her wish will come true that very night and that she will need to search for her brother through the fantastical Labyrinth and all the way to the fabled Goblin City, where she must confront Toby’s kidnapper, the dreaded Goblin King Jareth (played by Bowie sporting a Tina Turner wig of epic proportions). The Labyrinth itself is a magnificent creation, the beautiful sets impressing far beyond their studio-bound nature, and like much else from the same people who brought us the classic ‘Dark Crystal’ (1982) or the disgracefully underrated television series ‘The Storyteller (1988), they display a weirdly magical veneer of realism that could have just as easily come from the mind of Terry Gilliam. The simple but well judged special effects and, of course, superb puppetry and animatronics, created a film for children that few other movies of the 1980s or 1990s managed to equal. And with several songs featuring throughout (sung by Bowie obviously), as well as the hugely enjoyable gospel-driven ‘Underground’ released as a single, the film scored musically too with a timeless approach that has yet to fade. Despite high expectations for success the movie was inexplicably unsuccessful upon release, especially in the U.S. market where audiences and critics alike generally panned it (so that it failed to even recoup its substantial budget). However a steady success in VHS and later DVD sales ensured a substantial cult following, almost entirely amongst adults who appreciated the elaborate Pythonesque-like atmosphere of the movie as well as the underscore of adolescent sexual awakening represented by Sarah’s relationship with the Goblin King. As simple as the storyline was, the currents underlying it of the sad but inevitable fading of childhood and the oncoming of the harsher realities of adulthood, gave it a darker, more substantial edge than most Fantasy movies, even those intended for an adult audience, and an optimistic ending showing that not all of childhood need, or should, be left behind created an appealing message for many (and if you’re reading this probably you too). 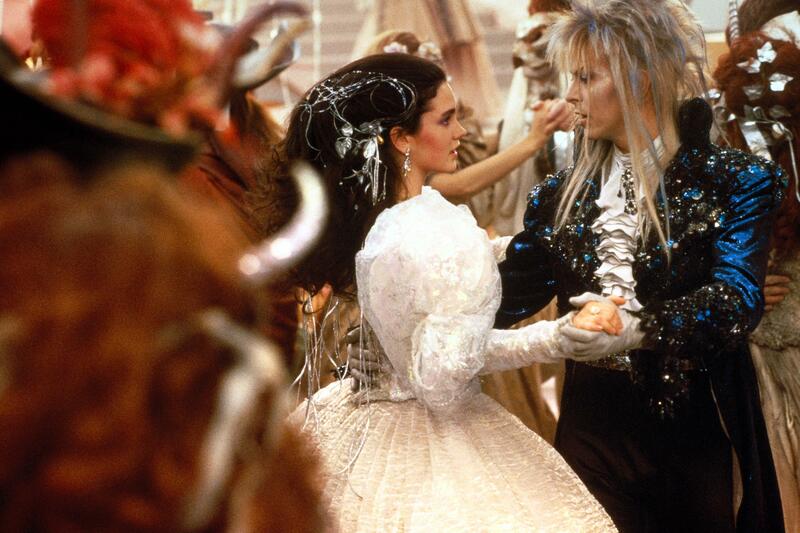 As well as a popular masquerade ball held by ‘Labyrinth’ fans in Los Angles every year, and a line of Manga books called ‘Return to Labyrinth’ released over the last five years, several excellent editions of the movie are available on DVD and Blu-ray, and all with thankfully substantial extras. As a not-so-secret ode to childhood and its inevitable passing, few Fantasy movies can compete; but few others can also state with such confidence that nothing is lost: not if we don’t want it to be.